Ok, so maybe I should call this “The best SCD pizza crust (in my opinion)”. It’s true that we all have different tastes. 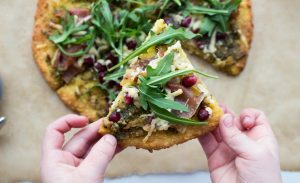 Why do I call this the best SCD pizza crust? For a few reasons. It tastes the best out of all the recipes I have tried. A few minutes after coming out of the oven, you can pick a slice of this up like regular pizza! This is huge for me. Sure, you can make pizza bases with cauliflower and courgette. None of them even come close to a regular pizza as you can’t pick them up. My daughter and husband love this recipe and would forgo regular pizza for this. They are my harshest critics. When they tell me something is delicious, I believe them. They are not shy in pointing out when something goes wrong. Even at three years of age, my daughter has quite the discerning palate. I decided to make this pizza crust without almond flour. I love almond flour, don’t get me wrong but coconut flour is cheaper and more readily available. 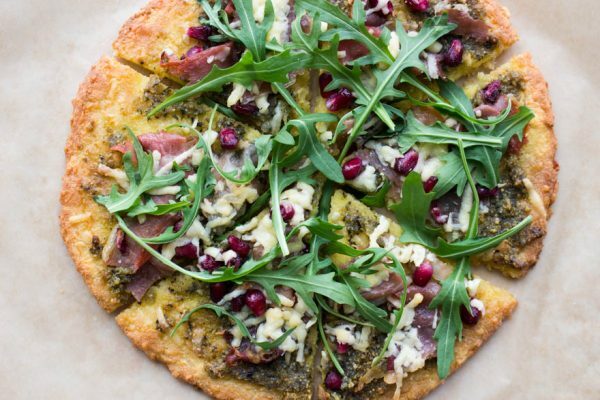 This has become our go-to SCD pizza crust. It’s often something I’ll whip up on a mid-week evening as it’s quick and I always have the ingredients to hand. I recommend using a vintage or mature cheddar in the recipe as it really makes all the difference. The toppings are really up to you. It’s a great way to use up leftovers in the fridge. On Thursdays, farmer’s market days, I love to top my pizza with some olives and local cheese. I also use pesto from the farmer’s market as a sauce for my pizza as I am nightshade-free. If you are ok with nightshades, feel free to use a tomato sauce instead. If you are following SCD, make sure you verify all the ingredients. Nightshades are a group of foods which some people with autoimmune conditions cannot tolerate. For the full list and an explanation, click here. If you can’t find a legal pesto sauce or want to make your own, I have a great homemade basil pesto recipe. 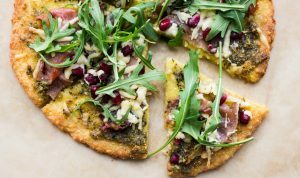 A delicious and easy pizza base for your favourite toppings. Gluten and grain-free. Specific Carbohydrate Diet-friendly. In a bowl beat the eggs. Next, mix in the salt and coconut flour and stir well to combine. Add the cheese and mix with the "dough". I do this with my hands. Keep mixing the cheese and dough until well combined and a ball has formed. Lay the ball out on a sheet of parchment paper. Lay another sheet of parchment over the dough ball. Press the dough ball with the palms of your hands to flatten. Don't use a rolling pin as that will roll it too thin. You want it to be a circle the size of a small dinner plate, about a 1/4 inch thick, roughly. Remove, top with pesto sauce first. Using a spoon, spread the pesto evenly on the crust. Then top with the remaining ingredients except for the rocket. Bake for another 12-15 minutes until the extra cheese has melted. Keep an eye on the crust for the last few minutes that it doesn't burn. Top with the fresh rocket and serve! * You can substitute an SCD-legal tomato sauce if you are not nightshade-free. *The ingredients in the Parma Ham should be only: pork leg and salt. Hope you like it Kristin! Could i just ask which coconut flour do you use as the the one i bought was really hard to swallow as really dense. Hi Nigel, Did you try this recipe? Are you referring to the coconut flour in this recipe being dense or in other recipes? I gave up on coconut flour for a while as I never liked the taste but recently I have been experimenting with it a lot and have come up with some great recipes using it (if I may say so). I just use regular coconut flour that I buy in Tesco : https://www.tesco.ie/groceries/Product/Details/?id=292053559. I find it is the quantities that really matter with coconut flour. You cannot use it like you would regular flour or even almond flour. Hope this like this recipe as much as I do. Let me know if you try it! I am wondering, would this be a single serving size pizza? I love the ingredients used (especially that you chose cheddar and not parmesan) but can’t decide if 1 cup of cheddar in one sitting would be problematic, even for the healthiest of people. This is something I have struggled with since adapting to a grain free diet….using alternative ingredients in much larger amounts than I did before grain free. How do you feel about this? Hi Heather, I have eaten one to myself without problems – but then I have never had a problem with cheddar cheese. Yesterday, I shared this size pizza with my husband and daughter (two slices each) and we had a salad and veggies as well. It really depends what you are having with it. To me it makes a great meal for two people with a side salad as well. Hope this helps and that you enjoy it if you try! Oh, yes, Have it with a salad. I did not even think of that. We are taking a break from coconut flour but when I add it back I will definitely try this. I just love how simple it is and as I said, that you used cheddar. Many pizza crust recipes call for parmesan. Which is so expensive and my kids do not like the strong flavor. Every member of my family will eat cheddar. I bet the high moisture content of the cheddar blends so nicely with the coconut flour. Thanks again for such a simple, quick, inexpensive recipe to try. Hope you have a lovely weekend!!! Glad to hear you all like cheddar! Yes, I’m really happy with this recipe. I was so sick of pizza crusts that used mountains of almond flour. I used to feel so heavy after eating them. Plus, the cost as you mention was so high! Hope you have a lovely weekend too :). Thanks for taking the time to comment. It’s lovely to hear some feedback! 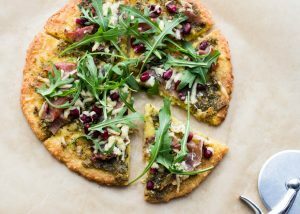 This is literally the best SCD pizza crust we have tried, and we have tried maybe 8 different recipes. This is my new go-to. My only minor change was to par-bake the crust for about 25 minutes before adding my sauce and cheese, since it really only needed to be warmed through after adding. If I was using toppings that needed more time in the oven, I would follow the recipe as written. Thank you for this!! I had my doubts. I dont care for savory coconut flour recipes. Wow. I put it in my cast iron skillet in the oven. The crust holds well. The cheese melted beautifully. I sprinkled garlic powder and now im going to go for my second slice. Thanks for the recipe. So glad you liked it. I was never a huge fan of coconut flour before but I have found that in the correct proportions, it makes wonderful recipes. And it’s healthy too so that’s a bonus! Thank you so much Jan. Glad you liked it! I made pizzas using your crust recipe for my family and and everyone truly enjoyed them! Thank you for sharing! It was one of those encouraging recipes that helped my husband and kids feel confident that we could withstand SCD for the long haul! Thank you so much! I love hearing feedback. So happy that your family enjoyed this too! It feels good to be able to enjoy pizza again for sure :)! In case anyone is wondering (because it hasn’t been mentioned yet), one crust has almost 500 Calories. I realize pizza isn’t the healthiest thing in the world, but no one really needs a whole cup of cheese + 2 eggs in a single sitting. There must be a way to make this a bit healthier without simply accepting that you can eat one tiny slice & be OK with it. Maybe subbing in some shredded zucchini for the cheese would help lighten it up a bit. Just to clarify that this blog doesn’t focus on calories. Most SCDers don’t count calories. After being sick for so long, most people are so glad to be able to eat foods without having a bad reaction to them. Of course if you think that this recipe has too many calories, then don’t eat it all in one sitting. I just simply post SCD recipes that I believe to be tasty and healthy. Not forcing anyone to eat this all in one go! Thank you! Yes after not being able to eat for so long, I need as much fat and calories I can get. Especially since the calories arent coming from carbs. Also, 500 calories a whole crust is NOT that bad… have a salad on the side as was mentioned previously. This pizza crust is the best! I topped it with some tomato sauce, garlic, basil, hard salami and olives. Im terrible at cooking anything and this was so easy, mine turned out great. It does have a slight coconut flavor, but nothing that really bothers me in return for an SCD pizza. My son cannot tolerate dairy. What would be your best suggestion as a substitute? The receipe sounds GREAT! I’m sorry I don’t have a substitute but you could try an almond flour base instead. Wow! 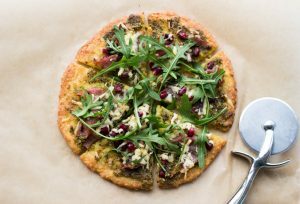 I have been on the SCD for many years and have been making an almond flour crust pizza, which I always enjoyed, but it was like eating pizza on pie crust. Just made yours and really enjoyed having a chewy pizza crust. Thanks for sharing this!